When I met the impeccably dressed Chris Lim at the opening of the Auckland flagship for luxury goods store Coach towards the end of last year, I was struck immediately by his passion and enthusiasm for all things bright and beautiful. This includes his sweet-smelling, wonderfully international baby - the extraordinary MARACA. The culmination of a life long dream to create a truly beautiful-yet-accessible lifestyle brand, MARACA was officially born in 2012 in Auckland, the city that Chris now calls home. At its helm is the effervescent and passionate founder, who sees the key touchstones of the brand as being: luxury, quality and style, with a firm emphasis on harnessing nature’s most effective ingredients. Born in Malaysia, Chris fell in love with the mysterious powers of fragrance and indulgence at an early age. “My aunt worked in the beauty industry and had the most amazing collection of perfume miniatures,” he told me over coffee at Toru at a later date, which would entice him to spend hours playing with them whenever he had the chance. “I really couldn’t keep away,” he adds with a laugh, and says that he has been obsessed by fragrance ever since. This soon led to an early career turn when he was employed behind the fragrance counter of a luxury store at the age of 17, before he moved to the Australian city of Melbourne to study marketing and retail management at prestigious Victoria University. 2012 saw him living in New Zealand and embarking upon the his life long dream to establish his own lifestyle brand in the form of MARACA, and just two years later the journey is fast picking up pace with the brand now sold internationally and new fragrance lines in constant development. The beautiful MARACA collection includes lush, decadent bodycare products as well as home fragrance lines divided by scent, story and inspiration. 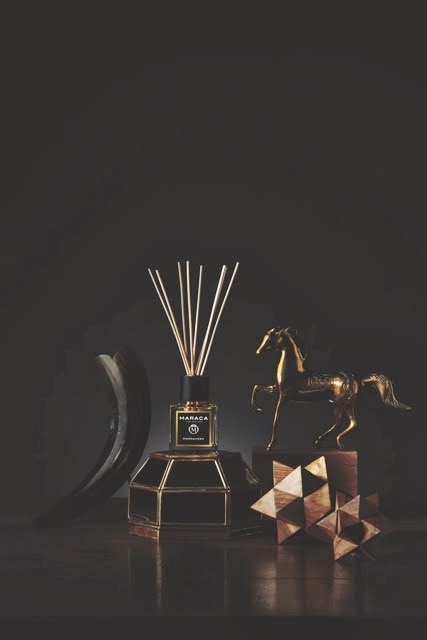 Each of the collection’s signature scents are designed by ‘nose’ Chris and formulated in France, whilst the range’s candles are individually hand-poured in New Zealand using natural plant waxes for better fragrance throw and a truly decadent feel. Not a detail has been left unchecked by the self-confessed “fashion and beauty fanatic”, and everything from the ingredients to the packaging is totally unique. My personal favourite from the line thus far is the ‘Sunset Dreams’ candle, which is the perfect accompaniment to long, warm, summer nights. Inspired by “culture and fashion” rather than merely the latest trends in beauty and bodycare, the brand is also proudly unisex with freshly designed, slick, clean packaging and scents that will appeal to men and women whether they are in bodycare or home fragrance form. To say that they would work a treat on any mantelpiece or dresser would be putting it mildly - they are built to impress and they most certainly do. To shop online or find a stockist near you visit the MARACA website here. It's about time New Zealand had a great luxury candle/fragrance line. I'm a sucker for a good jasmine and lily of the valley, so looking forward to trying out the White Jasmine and Bloom candles.